For a vehicle to be driven on Great Britain's roads there are 2 main legal safety requirements for the vehicle. Whilst they're connected, they're not the same thing, and they both have to be met independently. So, even if a vehicle is roadworthy, it may not necessarily have an MOT (it isn't automatic – it needs to go to a garage and get one!). And similarly, just because a vehicle has an MOT, it doesn't automatically mean it's roadworthy. It may have a defect that has come about after the MOT. After 20th May the MOT test will no longer be "pass" or "fail". Major or Dangerous faults found during the test, are automatic fails. A dangerous-graded fault means legally the vehicle cannot be driven on the roads without being repaired, this means a driver has to have that work completed there and then with the mechanic or have it recovered to another garage. DVAS taken the opportunity to make the wording on the MOT failure documents clear in reminding motorists that driving a dangerous vehicle is illegal. While it isn't an MOT Testers responsibility to try and physically stop customers from driving their vehicle, our testers will provide each customer with clear advice that they do have dangerous defects. Minor failures may still pass the test but all faults will be recorded on your car's MOT certificate and online record. Replacing the manual advisory given currently. 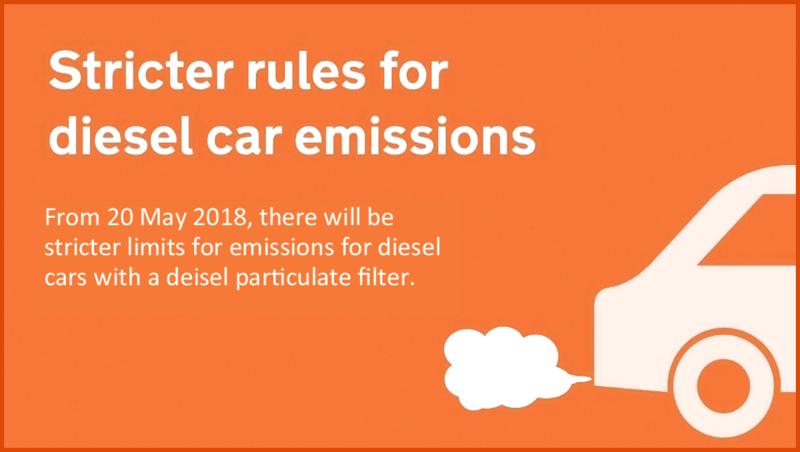 Check your car's handbook if you don't know if your car has a DPF. If you're not sure if it's been removed or tampered with our staff will be happy to assist, to check your car before an MOT. Brake discs 'significantly" or "obviously worn"
There will be other smaller changes to how some items are checked. Our MOT Testers will tell you at the time of MOT. It will list any defects under the new categories, so they're clear and easy to understand. Cars, vans, motorcycles and other light passenger vehicles won't need to have an MOT if they're over 40 years old and have not been substantially changed in the previous 30 years. 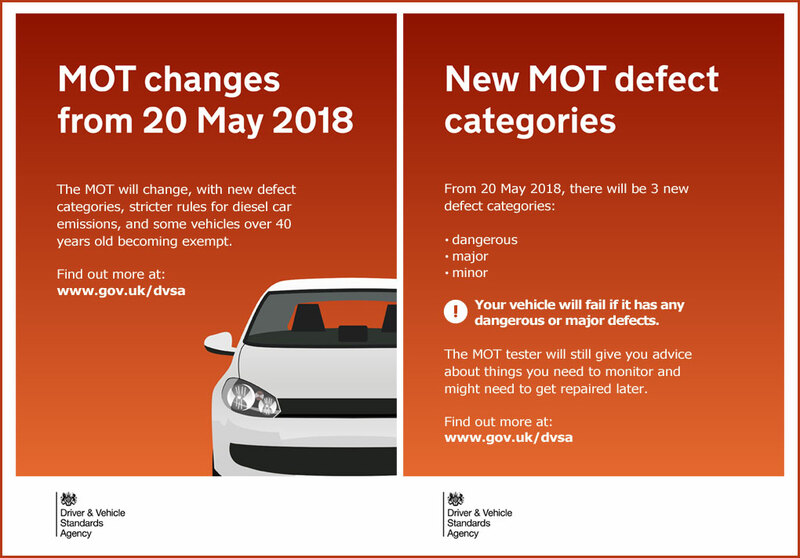 When the rules change on 20 May 2018, vehicles meeting the criteria won't need an MOT from the 40th anniversary of when they were registered. If a car was first registered on 31 May 1978, it won't need an MOT from 31 May 2018. What drivers will need to do? Drivers won't have to apply to stop getting an MOT for their vehicle. However, each time they tax their historic vehicle (even if they don't pay a fee), drivers will have to declare it meets the rules for not needing an MOT. Drivers must still keep their vehicle in a roadworthy condition. They can be fined up to £2,500 and get 3 penalty points for using a vehicle in a dangerous condition. An MOT is designed to check important parts on your vehicle to ensure your car meets the legal standards for safety and roadworthiness but does not cover the condition of engine, clutch or gearbox and cannot be used as a guarantee. The maximum fees MOT centres can charge won't change, for cars (up to 8 seats) £54.85, you don't pay VAT on the fee. Any questions or worries you can chat to Ian or Jack on the coming changes.